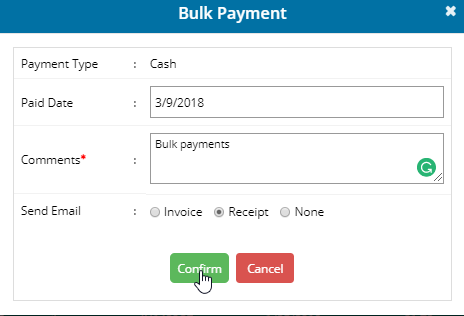 How to do bulk cash payment? From the main menu, Choose the Invoices/Payments feature. Set the search criteria as Unpaid Invoices and filter by as Cash from the list of payment type provided and hit on the search button. Select the number of invoices that you wish to make bulk payment as cash. Enter remarks and click on Confirm to Pay Selected Invoice to proceed with the bulk payments. Choose the payment date and enter comments, Then hit on the confirm button. Once the bulk payments have been done you have the option to view the Paid invoice details.